Mahatma Gandhi was the prominent leader of independence movement in British-ruled India. 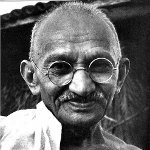 He led India nonviolently to independence and inspired numerous movements for civil rights and freedoms around the world. Mahatma Gandhi was assassinated by Nathuram Godse on January 30, 1948, outside the building where a prayer meeting was to take place. Gandhi was surrounded by the members of his family and followers, when he was killed. Godse bowed to Ghandi and then shot three times in the chest. After the accident Godse himself shouted “police” and surrendered. Mahatma Ghandi died about two hours later. The investigation revealed the Nathuram Godse wasn't alone. Eight people were accused of anti-government plot and death of Gandhi. Two of them were sentenced to death penalty and hung. The president, the vice president, the prime minister, the defense minister and the three service chiefs of India gather at the Raj Ghat memorial to lay the wreath to honor Mahatma Gandhi. A two-minute silence is observed at 11 a.m. across the country to commemorate the death of Mahatma Gandhi, the Father of the Nation.